From a distance, Lung Cu is a spectacular sight in Ha Giang and referred to as “A high forehead of the motherland.” Tourists in Vietnam travel getting the chance to visit this Northern mountainous province don’t miss an attractive- tourist destination- Lung Cu where you can take in the imposing beauty of landscapes and the diverse ethnic groups living. 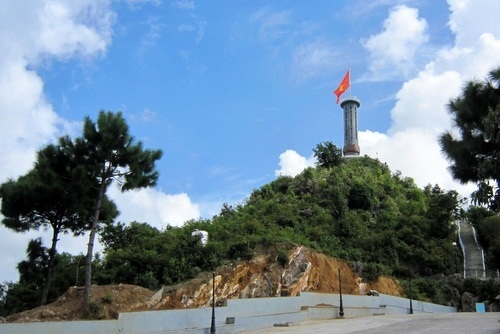 Especially, you can see the Lung Cu flagpole, inspiring a deep sense of pride in Vietnamese. Driving over 400km from Hanoi following National Highway 2 and 4C, the rocky plateau of Dong Van awaits visitors in Vietnam travel, with mountain paths like blood vessels sticking to the land standing between them and the summit of Lung Cu. From a distance, Lung Cu is a spectacular sight, with the view dominated by giant boulders and the national flag flying above Dragon Mountain, all set to the backdrop of magnificent forests. The flag tower itself stands proudly 1,600m above sea level. Its design is an imitation of the Hanoi Flag Tower, with eight bronze drums guarding the sides of the octagonal tower. The national flag adorning the top of the 135-stair tower has an area of 54m², symbolizing the unity of Vietnam’s 54 ethnic groups. From the top of Dragon Mountain, the paddy fields and earthen-walled houses dot the sumptuous panorama, interrupted by two lakes that are said to be the dragon’s eyes. Even though people say that Lung Cu is a ‘thirsty’ land, the lakes never dry out. The houses in Lung Cu also betray the superstitions of the people who live in them. Charms hang over the doors to expel demons and evil spirits, and the ancestral altar is carefully placed opposite the main door. The houses are usually open plan, but when newly-weds are welcomed into a family, the hosts use fabric to make a private compartment for them to enjoy. Lung Cu Commune is home to nine villages, situated at a height of between 1,600-1,800m above sea level. In the winter, the weather is very cold, and sometimes it even snows. There are seven ethnic groups in Lung Cu. They are very friendly and hospitable. Visitors to their houses are considered distinguished guests, even if they are strangers. A bowl of their maize wine will soon warm you up. Most ethnic people in the area cultivate rice and the Mong and Lo Lo still preserve the traditional weaving industry with flax fibres. Lung Cu is also the land of the peach, the plum, tea, honey wine and Thang Co (horse meat hot pot). The bustling markets where the honey-yellow sunlight has never changed, the cheerful, shy smiles of the ethnic girls in colorful, handmade dresses, the playful grins on the children’s faces, and the welcoming nature of the people as a whole never fail to charm visitors in Vietnam travel. This entry was posted in Ha Giang and tagged Hanoi Flag Tower, Hà Giang, Vietnam travel. Bookmark the permalink.